Red Firecrackers – The Legend of the First Chinese New Year! A spectacular production of dazzling props, colorful costumes, mesmerizing music, fantastic acrobatics and lively dance by top notch performers telling the story of the origin of the Chinese Lunar New Year. In this legend, a group of villagers, working, dancing and praying together, defeated an a terrifying monster of the ages. A heartwarming story highlights the intrinsic value of coming together, courage, hard-work and ingenuity. It also explains some of the origin of the tradition of the Chinese Lunar New Year when everyone is wearing red, giving red envelopes to children, putting up red decorations, and lighting up all the dark corners the red firecracker to make loud noises. Learn how you can Celebrate the Chinese New Year ! 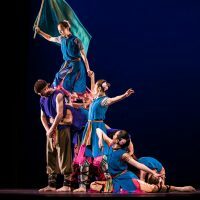 Every year, Nai-Ni Chen Dance Company brings an amazing production to concert stages around the United States to celebrate the Chinese Lunar New Years with thousands of audience members. However, Choreographer/Artistic Director Nai-Ni Chen laments that very few people know how to properly celebrate the Chinese New Year. She decided to tell the story of Nian, the First Chinese New Year in her native language of dance. She also encourage every audience to ask questions, learn how to celebrate the Chinese Lunar New Year. In the ancient times, before there was a Chinese New Year Celebration, in a far away village in China, people live joyously together in harmony with nature. But, every 365 days, a monster called Nian comes to terrorize the people. The Villagers trained themselves in martial arts to defend themselves, but even the greatest warrior among them does not seem to be able to defeat the Nian Monster. The villagers, with no where to turn, prayed to the heaven for help. Finally, the villager’s prayers to the gods are answered, and the ideas from heaven worked to repel the vicious monster that comes every year. In order for everyone to remember what they needed to do every 365 days, They used name of the Monster, Nian to be the same as the word for “Year”. To celebrate another year absent of the Monster, people say “Guo Nian”, meaning the danger of another Nain visit has passed. On the New Year’s Day, people greet each other saying “Gung Xi, Gung Xi”, as greetings, they wear red color clothing, giving red envelopes to children, covering everything with red color, playing loud firecracker to ward off the Nian. Suitable for children ages 4 -15.